When the radar sensor detects that a frontal collision is highly likely or even unavoidable, safety systems such as the brakes and seat belts are automatically engaged to lessen impact as well as vehicle damage. The pre-collision system can be turned on and off as necessary by operating the switch. When a high possibility of a frontal collision is detected, the pre-collision system warning light flashes, a buzzer sounds and a message is shown on the multi-information display to urge the driver to take evasive action. When there is a high possibility of a frontal collision, the system applies greater braking force in relation to how strongly the brake pedal is depressed. 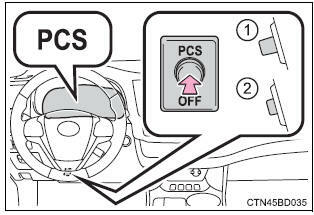 The system may not warn the driver using a warning light, warning display and buzzer when the system detects and judges braking operations. When there is a high possibility of a frontal collision, the system warns the driver using a warning light, warning display and buzzer. If the system determines that a collision is unavoidable, the brakes are automatically applied to reduce the collision speed. 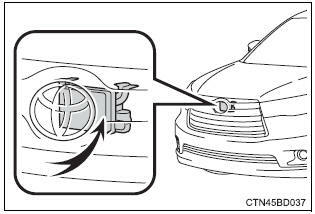 The pre-collision system warning light comes on when pre-collision system is disabled. The radar sensor detects vehicles or other obstacles on or near the road ahead and determines whether a collision is imminent based on the position, speed, and heading of the obstacles. Vehicle speed is greater than about 10 mph (15 km/h). The speed at which your vehicle is approaching the obstacle or the vehicle running ahead of you is greater than about 10 mph (15 km/h). The vsc off switch is not pressed. Vehicle speed is greater than about 19 mph (30 km/h). The speed at which your vehicle is approaching the obstacle or the vehicle running ahead of you is greater than about 19 mph (30 km/h). 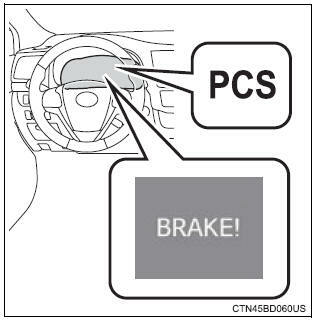 When the system is activated in the situations described above, there is also a possibility that the brakes will be applied with a force greater than normal. The sensor cannot detect plastic obstacles such as traffic cones. There may also be occasions when the sensor cannot detect pedestrians, animals, bicycles, motorcycles, trees, or snowdrifts. When a malfunction occurs due to sensor contamination, etc. That results in the sensors being unable to detect obstacles, the pre-collision system will be automatically disabled. In this case, the system will not activate even if there is a collision possibility. The pre-collision system warning light will flash and warning messages will be displayed. For vehicles sold in the u.S.A. This device complies with part 15 of the fcc rules. Operation is subject to the following two conditions :(1) this device may not cause harmful interference, and (2) this device must accept any interference received, including interference that may cause undesired operation. Radiofrequency radiation exposure information: this equipment complies with fcc radiation exposure limits set forth for an uncontrolled environment. This equipment should be installed and operated with minimum distance of 20 cm between the radiator (antenna) and your body. Operation is subject to the following two conditions: (1) this device may not cause interference, and (2) this device must accept any interference, including interference that may cause undesired operation of the device. Do not overly rely on the pre-collision system. Always drive safely, taking care to observe your surroundings and checking for any obstacles or other road hazards. Failure to do so may cause an accident resulting in death or serious injury. Observe the following to ensure the pre-collision system can function effectively. Otherwise, the system may not function correctly and could result in an accident. Keep the sensor and grille cover clean at all times. Clean the sensor and grille cover with a soft cloth so you do not mark or damage them. Do not subject the sensor or surrounding area to a strong impact. If the sensor moves even slightly off position, the system may malfunction. If the sensor or surrounding area is subject to a strong impact, always have the area inspected and adjusted by your toyota dealer. Do not disassemble the sensor. Do not attach accessories or stickers to the sensor, grille cover or surrounding area. Do not modify or paint the sensor and grille cover. Do not replace them with non-genuine parts. By means of alarms and brake control, the pre-collision system is intended to assist the driver in avoiding collisions through the process of lookjudge- act. There are limits to the degree of assistance the system can provide, so please keep in mind the following important points. Assisting the driver in watching the road the pre-collision system is only able to detect obstacles directly in front of the vehicle, and only within a limited range. It is not a mechanism that allows careless or inattentive driving, and it is not a system that can assist the driver in low-visibility conditions. It is still necessary for the driver to pay close attention to the vehicle's surroundings. Assisting the driver in making correct judgment when attempting to estimate the possibility of a collision, the only data available to the pre-collision system is that from obstacles it has detected directly in front of the vehicle. Therefore, it is absolutely necessary for the driver to remain vigilant and to determine whether or not there is a possibility of collision in any given situation. Assisting the driver in taking action the pre-collision system's braking assist feature is designed to help reduce the severity of a collision, and so only acts when the system has judged that a collision is unavoidable. This system by itself is not capable of automatically avoiding a collision or bringing the vehicle to a stop safely. For this reason, when encountering a dangerous situation the driver must take direct and immediate action in order to ensure the safety of all involved.